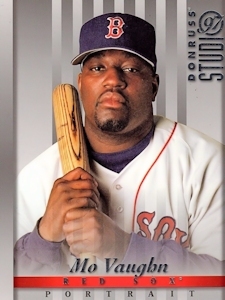 ON THIS DATE (May 30, 1997) ... After Mo Vaughn's third home run of the game tonight, it was expected that the Fenway Park crowd of 32,341 to give the Red Sox first baseman a curtain call. Who could doubt him after he hit everything in sight on a 4-for-4 night, a line single off the Wall in the first, a home run into the Red Sox bullpen in the third, a home run over the screen in the fourth, and another shot into the corner of the bullpen closest to the center-field triangle in the eighth. Official distance of Vaughn's home runs: 392 feet, 447 feet, and 410 feet. Total: 1,249 feet, or 71 feet shy of a quarter-mile. O'Leary, who had just six hits in his last 43 at-bats and one home run all month, started off Boston's three-homer fourth off Yankee starter Mendoza, who came into the inning having already given up seven hits, including Vaughn's first home run, and three runs. Singles by John Valentin, Nomar Garciaparra, and Darren Bragg made it 4-0, and out came Mendoza. In came Rios, a 25-year-old rookie making his big-league debut. Rios was born in Madrid; if this had been a bullfight, it would have been called on account of blood. The first strike Rios threw in the major leagues, Cordero hit into the left-field screen for a three-run home run that made it 7-0. Then Rios went to a full count on Vaughn, who went opposite-field and hit the next pitch onto Lansdowne Street. Vaughn, who had homered in the bottom of the ninth Thursday night, gave fans something they'll never forget when he led off the bottom of the eighth off Lloyd, an Aussie, and hit one halfway to Sydney. It wasn't just the fans who appreciated what they saw here tonight, it was his teammates.